Read below to see how I made my morning meeting calendar. 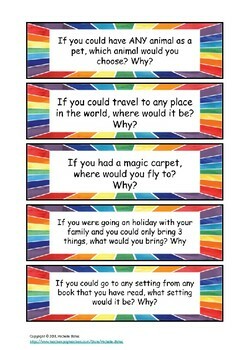 The 'I wonder' questions are very popular. I have just created a deluxe version with rainbow borders and 13 new questions. You can get these in my tpt store on the following link: I wonder deluxe. Scroll down for the original version. I found a great site, Mama Jenn, that had a great calendar for morning meetings. I decided to recreate one for my classroom and change a few things for my needs. (click on the Mama Jenn link for original calendar). I decided to keep the day, month and year (like Mama Jenn)- however I decided for the date to have proper dates instead of numbers. In Australia, our date goes day/month/year, so I also decided to put them in that order on my board. Read below about how I use 'I wonder questions'. I have just created a deluxe version with rainbow borders and 13 new questions. You can get these in my tpt store on the following link: I wonder deluxe. Scroll down for the original version. I decided to add on a question of the week to get my students thinking, wondering and using their imaginations. I have about 45 questions and each Monday I will ask one and the students can discuss their answer with a partner. Each day during the week for a few minutes we can discuss this question, add further questions to the topic and even extend it to a writing session. Like Mama Jenn, I decided to keep how many days have we been at school because I think that is a great idea to help students practice their place value on a daily basis. Thats about it, again- not my original idea, but adapted it to my needs.